Please accept my blessings. I am in due receipt of your two letters dated 24th June, 1971 and undated respectively, and have noted the contents. I'm very sorry that you are separated from the temple for the time being. But don't worry. Krishna will save you, you can be sure. There is no doubt about it. So go on chanting Hare Krishna at all costs and never mind these tribulations of maya. Go on chanting Hare Krishna. Krishna is in your heart. Pray to Him for your protection and soon all things will be adjusted and you will again be in the association of devotees. Of that you can be sure. Hoping this will meet you in rapidly recovering health. Please accept my blessings. Enclosed please find tape no. 2 from L.A., 4th Canto, 8th chapter. Kindly acknowledge date of receipt. I hope that by now you have got the throne, etc. all ready for installation ceremony. By the middle of July I shall be going to N.Y. and at that time you can send us tickets for going to Boston also. From Boston I shall go to New Vrindaban, come again to N.Y. and then go to London. Please accept my blessings. Presently I am in L.A. and very soon will be making my way back to Calcutta, and Mayapur, via Europe. First I will go to N.Y. by the middle of this month and then go London. From there I will go to Bombay and Calcutta. So I am very much anxious to know about the arrangements being made for laying the corner stone in Mayapur. My desire is that it be done on the 15th August, 1971 or round about that day. If Indira Gandhi cannot come on the 15th August, then some other day will be all right. But the ceremony must take place. So please let me know the latest development. I am anxious for your reply. Please accept my blessings. You will be glad to know that very soon I am planning to come to N.Y., as you have requested in your mailgram dated 29th June, 1971. So you can arrange for three world return tickets starting from L.A., to N.Y., to London, to Paris, to Bombay, to Calcutta, to Tokyo, to Honolulu, to L.A. once again. Last time Karandhara arranged for five tickets: Tamala Krishna, Madhudvisa Maharaja, Kirtanananda Maharaja, Karatieya Maharaja and Devananda Maharaja, as well as myself. So this time you can arrange for three tickets only. So keep the date open and when the day has been fixed up, I will let you know. Also, I am wanting many men to go to India. At a recent meeting of the temple presidents from the West coast, I asked that each of our nearly 60 centers send at least one man to India. So if you can make arrangements like that, it will be very nice. Many men are required there; they don't have to be very important members. We are arranging for a big temple in Mayapur, the birthsite of Lord Caitanya. So we shall discuss further on this matter when I go there. Please accept my blessings. You will be glad to know that we arrived safely in Moscow and stayed there for five days. There are many younger Muscovites who are very much anxious to join our movement. Unfortunately the government is so strict that it is difficult to take their cooperation for starting a center there. Everything is strictly under government control. Still we are trying to open a center with the help of local men. The city is very big and there are many nice buildings, roads, etc. but life is not very happy. One cannot live according to his own choice. Fruits and vegetables are very scantily supplied. Milk, butter and yogurts are amply available, though. From Moscow, I went to Paris. Paris is a very nice city, better than London. All historical buildings are there and they are very gorgeous and panoramic. So we have got a very nice center there. The address is as follows: 26 Rue Etienne d'Orves; Fontenay aux Roses; Paris 92. I stayed only one day on my way to L.A. but still they arranged some nice meeting and a press conference and the people were favorably impressed. They admitted in different papers that our movement is genuine along with other information. From Paris I went directly to L.A., about 6,000 miles at one stretch and I was on the plane for 12 hours, therefore getting a one day concession. From L.A. I went to San Francisco yesterday and the Rathayatra festival was very very gorgeously performed. There were three Rathas consecutively and Lord Jagannatha's Ratha was bigger than the other two. People received us so nicely and one mayor was the chief guest in the meeting in which more than 10,000 people assembled. The mayor spoke very highly of our movement. She is very much impressed with the basic principle of our Back to Godhead movement. In this way we are getting support gradually in the U.S.A. Maybe our movement will be supported in the future by the United Nations. So we Krishna Consciousness people have accepted a very important and responsible task in the whole world, therefore, our principal work also must be very responsible. I am very much anxious to know what is happening about the houses. To tell you the truth, I am willing to purchase the Little Gibb's road house of Mr. Vakil. The terms offered lately are as follows: 1) $80,000 American by three yearly installments; first (down payment) at $25,000; $25,000. and $30,000 respectively. The total price should be not more than 16 lacs. Out of this, 10 lacs plus 40,000 will cover the payment in dollar money. The balance 5 lacs plus 50,000 would be paid as follows: Down payment of 1 lac, 60,000 or 70,000 and the balance money at Rs 10,000/- per month. The tenant on the upper story will be Mr. Vakils responsibility. The procedure should be like this: As soon as the sales agreement is done, we pay the down payment of 1 lac, 60 or 70,000 and he gives us possession of the ground floor. Immediately after taking possession of the ground floor, we pay a check of $25,000. for immediate encashment. Then he clears out the upper story tenant and we go on paying him Rs 10,000 per month, and dollars payment as arranged. So if possible, do the needful with the help of Mr. Chabria and try to secure that house and reply this letter to our London address. Please accept my blessings. You will be pleased to know than I have again begun my translating work. Enclosed please find tape no. 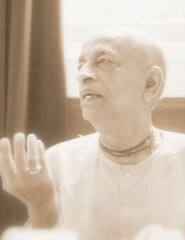 1 from L.A. (Srimad-Bhagavatam, 4th canto, 8th chapter). Please acknowledge receipt and date of receipt also. Presently I am in L.A. where I just returned from the very successful festival, Rathayatra festival, in San Francisco. From here I will be going to London to participate in their Rathayatra festival on 4th July. Shortly thereafter I may be going to N.Y. Formerly, in 1966, I was dictating two tapes daily, but after becoming ill, I reduced. But very soon I will be sending you so many tapes that you will be over-burdened with work. Please accept my blessings. I thank you very much for your letter dated 19th May, 1971 and have noted the contents. I am so glad to learn that Hrdayananda Prabhu has joined you in Gainesville and that you have got a nice place also. Now my desire will be fulfilled. I have wanted a center in Florida for a very long time. Two years ago I tried to open a center there with the help of one local gentleman but it was not very successful. So you are intelligent boy; I have heard so from Gargamuni Swami, and now Hrdayananda is there also. So do something wonderful there in Gainesville. Wonderful means simply you chant loudly and distribute prasadam. That is not very difficult. It is very easy. Simply if you do it enthusiastically and sincerely, then success will be there. You can surrender by doing your best to preach this Krishna Consciousness in Florida. That will make you perfect. My Guru Maharaja wanted me to preach this cult in the Western world, so I have tried my best. Please accept my blessings. I am very much anxious to know of the progress of work at Mayapur. Before my leaving Calcutta it was estimated that Rs 5000/- would be required for fencing the whole ground with iron stand and barb wiring. I left this money with Tamala Krishna for doing this work immediately, but from his latest letter I understand it has not been done and the estimate has increased to Rs 14,000. I do not know who submitted the former estimate. Anyway don't spend so much money for fencing. Better to have bamboo fencing and hedge plants and during the rainy season they will grow sufficiently all around. Better in this connection to take advice from Sarkar or from the persons who sold us the land. I am very anxious to know of reports from Mayapur and if every week you will send me elaborate reports, I will be very much appreciative. Yesterday evening there was a meeting of all the different presidents of all the different temples and I have impressed them with this fact and they are doing so nicely and sincerely. So you have got a very responsible task in Mayapur also--to develop that temple. So send me weekly reports and may Krishna bless you more and more. Please accept my blessings. I hope things are going well there and Mayapur development is going on and that the fencing is being done also, as I instructed you in my last letter. So far my travels, from Bombay you may have heard, I went to Moscow. We stayed there for five days. There are many younger Muscovites who are very anxious for joining our movement. Unfortunately the government is so strict that it is difficult to take their cooperation for starting a center there. Everything is strictly under government control. Still we are trying to open a center with the help of local men. The city is very big and there are many nice buildings, roads, etc., but life is not very happy. One cannot live according to his own choice. Fruits and vegetables are very scantily supplied, but milk, butter and yogurt are readily available. From Moscow I went to Paris. Paris is a very nice city, better than London. All historic buildings are very gorgeous and panoramic. So we have got a very nice center there. The address is: 26 Rue Etienne d'Orves; Fontenay aux Roses; Paris 92. I stayed only one day on my way to L.A. but still they arranged some nice meetings and a press conference and the people were favorably impressed. They admitted in different papers that our movement is genuine, along with other information. From Paris I went to L.A. directly, about 6000 miles at one stretch and I was on the plane for twelve hours, thereby getting a one day concession. From L.A. I went to Rathayatra festival in San Francisco yesterday and the festival was very gorgeously performed. There were three Rathas and Lord Jagannatha's Ratha was bigger than the other two. People received us so nicely and one mayor was the chief guest in the meeting in which more than 10,000 gathered and the mayor spoke very highly of our movement. She is very much impressed with the basic principle of our back to Godhead movement. In this way we are getting support gradually in the U.S.A.
Maybe our movement will be supported in the future by United Nations. So we Krishna Consciousness people have accepted a very important and responsible task in the whole world. Therefore our principle work must also be very serious and responsible. The ceremony for laying down the corner stone on Vyasa puja day or some days after must be performed. If Indira Gandhi can not attend, then the governor of Bengal, Mr. Bhawan, should attend the function. I think Syamasundara. has written Gurudasa in this connection and so you should take serious concern of this fact. Regarding the fencing, I have instructed Acyutananda not to spend too much for boundary fencing, but it must be done immediately so that during the ceremony we may fix up many different tents to accommodate guests who come during the ceremony. In yesterday's meeting of the temple presidents in Berkeley, I have asked them to send at least one man from each center and they are accepting. So very soon 60 men will come to India with some good leaders. We have to do some tangible work in India and so do everything cautiously and carefully. Please accept my blessings. I beg to acknowledge receipt of your letter dated 16th June, 1971 and have noted the contents. We have come to Moscow on the 20th instant evening and I'm staying at the above hotel. The place is centrally situated amongst important buildings of Moscow. Yesterday afternoon we had a tour for three hours to see respective important places. The city is well-planned. There are big big houses and roads and at day time the streets are busy with buses, cars, and underground trains which are far better than American or English. The underground streets are very neat and clean. The surface streets are also daily washed. But there is some difficulty in collecting vegetarian foodstuffs; still we are cooking our meals by the cooker, which has saved our lives. We talked with one big professor Mr. Kotovsky and Syamasundara talked with many great writers and musicians. Two boys are working with us; one Indian and one Russian. So there is good prospect for opening a center, although the atmosphere is not very good. The Embassy was no help. So our visit to Moscow was not so successful, but for the future, it is hopeful. Tomorrow I go to Paris for one day, then to S.F. Rathayatra and then I shall come back to London. So you can reply me this letter in London address. Re: Mayapur, the laying down of the corner stone must be done by the end of August. I've already informed GBC members that they should meet there on Vyasa Puja Day. That function must be there. You hold that function, and in the meantime I am going to America and Europe to find men to send there. So far as the fencing, I am sorry that it is not done yet. At first the estimate was Rs 5000, but now it is Rs 14,000/- so what is the use of such estimate? Please contact Sarkar. Don't spend too much on fencing because if we want to expand, we have to tear it down. Put up bamboo with hedge creeper to make the walls. The creeper will grow luxuriously in the rainy season. The temporary hut should be immediately finished. Three rooms is all right. If possible make another because when the boys come from USA, they'll have to be accommodated. If Indira Gandhi is not coming, you can arrange with the Governor Mr. Dhawan, the High Commissioner for London. He is known to us and can help by coming there. It will make a nice reception if Indira Gandhi is not coming. Otherwise, if she comes, all officials will come. So plan for the program. After this we have to plan for Maidan Festivals in nice places. We know three nice places: 1) at Induria (Mahatma Gandhi Road); 2) Bhagbazar; 3) Chorebagan (Mullick's House). These three places I can arrange by writing letters. Similarly, at other places we can hold such meetings. The old man who comes to our Calcutta temple, Nagan, came to see me in Bombay. He said we have saved Calcutta and the Naxalites are in favor of our Calcutta will change. Re: Mayapur construction, the best thing is to get the help of a nice architect - either the man who drew the plans or Mr. Muckerjee who came to see us. His office is at 8/2 Hastings St., top floor. So let us supervise amongst ourselves. Purchase the goods and engage laborers to work nicely and Mr. Sarkar will help. First the cornerstone should be laid down and on an auspicious day, construction should begin. You can arrange for collecting funds and materials for construction very easily in Calcutta, so do like that.